← Frozen Frozen Cake… By accident! My new favorite hat. Courtesy of the awesomely talented KnitTwit Knome. It’s naptime… I know, SO RARE! As I have these few free moments midday, I thought I’d try to sneak in a quick post. The truth is, something’s been eating at me, something I’ve been dying to share with my friends and readers, but really wasn’t sure how… so I’m just going to rip off the band-aid: I have a confession to make. For the last year, or so, I have been sneaking around Vegas, mostly at night, while my kids are tucked snug in their beds, while my husband stays faithfully at home… but occasionally on the weekends while they’re busy doing their own thing… but sneaking nonetheless. It started small, just a little here and there. But in the last few months it’s grown into an all out obsession. I find myself looking forward to it, and even making time once a week. It’s totally trashy, most of what I’ve been doing, and I almost always come home feeling downright dirty. I even have to take a shower to get the filth off before I feel like I can touch any of my unknowing family. The point is, I just can’t do it any longer, not alone anyway. While it feels so wrong sneaking around, I kinda like the thrill, the problem is it’s simply gotten too big, I can’t manage to sneak it all in to just a few hours here and there. I find myself digressing from my typical jogs, it’s been a struggle to stay focused. So a few months back I finally fessed up, and have since started a support group. It turns out there are others lurking about with my same naughty little obsession. I call them my Gnomies. They seem like ordinary people, moms, dads, entrepreneurs, police officers, graphic designers, nurses, and various others, lovely people, all of them. Best of all, they relate to me, and my bizarre habit of sneaking around. Many of them keep the same hours, as to not involve the children, well, most of the time anyway. <;’) Even my amazing hubby has jumped on the Gnomie wagon, he’s my Gnomeo after all! So what’s all this nonsense about? Here it goes: I have a thing for sneaking around and doing kind things for people (I know, you knew that), but it’s not just in my home, I enjoy gnoming just about everywhere! Picking up trash on my jogs, leaving sweet notes for people under rocks (which are clearly not where they belong), picking weeds… in other people’s yards, mending things that have gone unattended, oiling squeaky community gates, cleaning graffiti off playground equipment, leaving surprises on doorsteps (the good kind, not the mysterious brown bag variety! ), replacing drippers on irrigation geysers, that sort of thing. 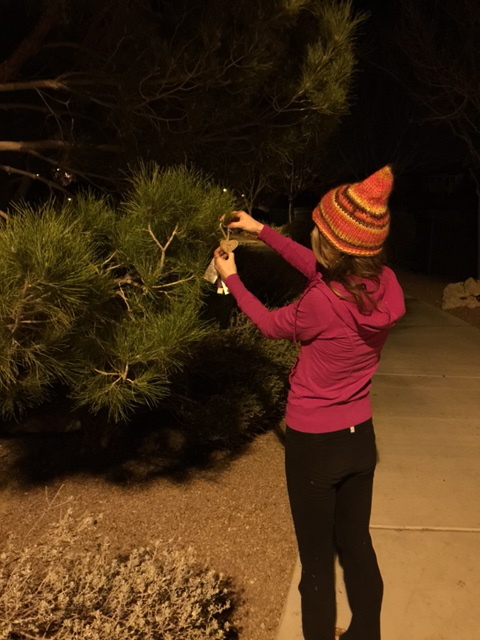 The problem was I was starting to see all the things that needed mending instead of going about my business, a 7 mile jog was becoming a several hour litter detail… in the middle of the night… I needed help. Once I started telling a few close friends about my crazy little hobby, it turned out others were either already doing similar things, or extremely interested in joining in on my antics. 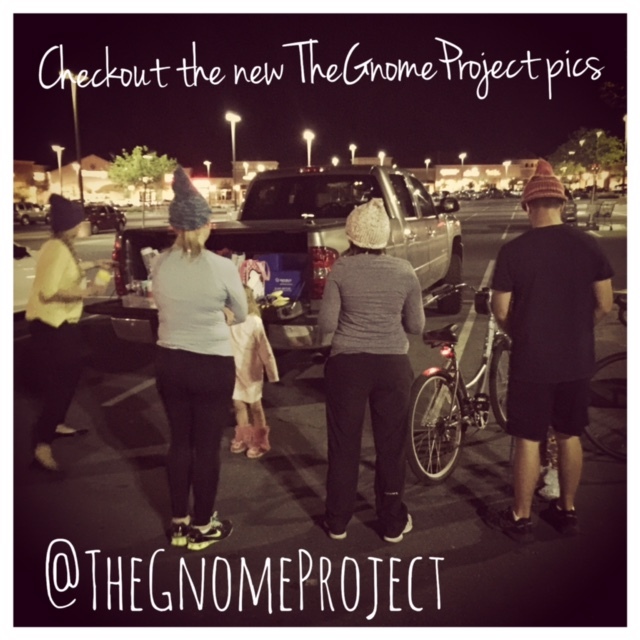 So with some amazing support form my closest Gnomies, “The Gnome Project” was born! We kicked off The Gnome Project in February with the beautiful suggestion of KnitTwit Knome. 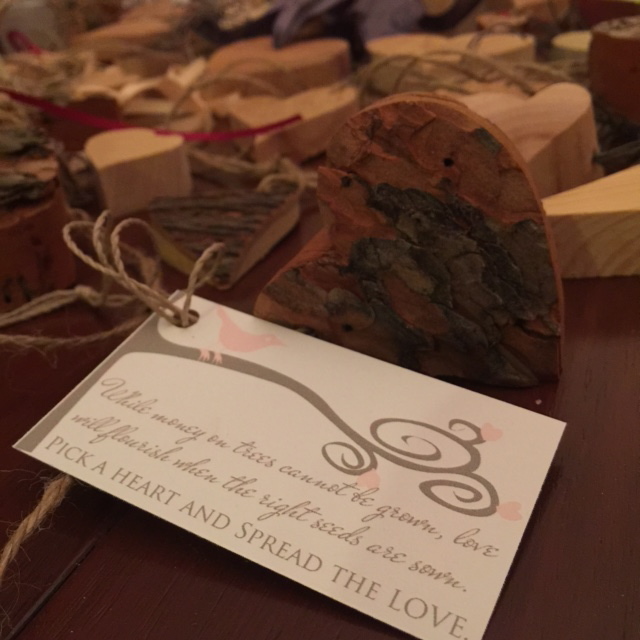 She had this awesome idea to help love grow on trees… and so, with some amazing help from Lovely Lumber Gnome (another of my favorite Gnomies), it did the evening before Valentine’s day! I’ve been battling with myself on whether or not to out ourselves as the involved parties, but then it occurred to me, that we could spread even more kindness, love and joy by letting a few other people in on the project. 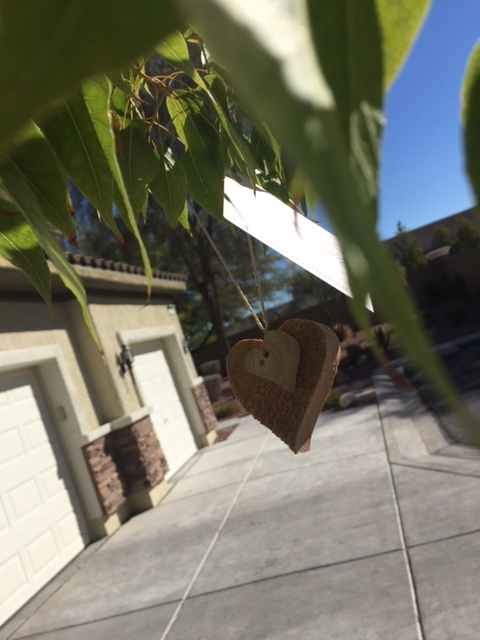 So February we kicked off what we’re calling the “Gnome Gnation Monthly Meet-ups” by literally spreading love for people to find and share with their favorite people. We walked, biked, and jogged to tidy about 6 total miles of sidewalk the night of March 16th (and early morning of March 17th), in order to help make our community a little “greener” for St. Patrick’s Day! In total we filled 4 recycling bins and had about a garbage bag worth of (unrecyclable) garbage. It was a huge success, and I can’t wait for this project to grow and evolve. What’s on the agenda for April? 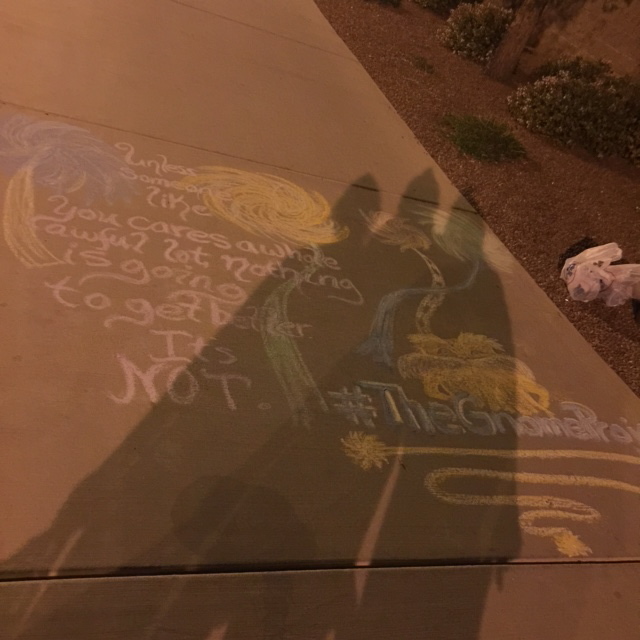 Follow us on Instagram @TheGnomeProject, or “Like” our community page on Facebook, “The Gnome Project” to keep in the loop! Are you a gnome? 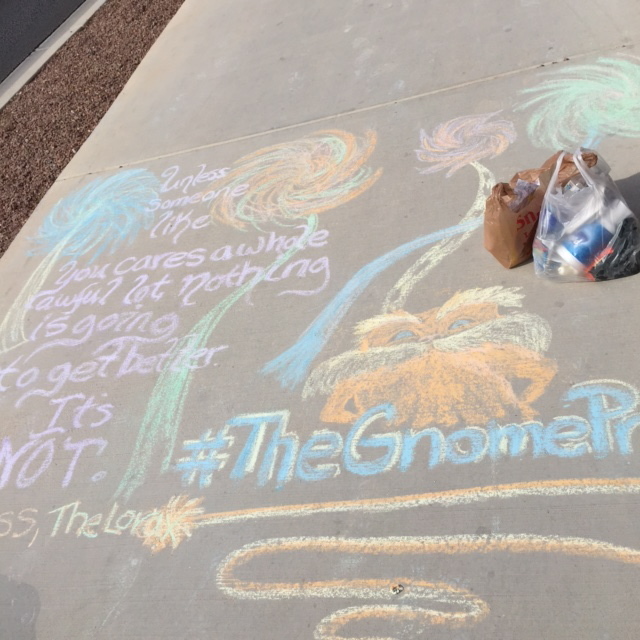 Post your Gnomie picks #TheGnomeProject, or on our Facebook community page! If you or a gnome in your life would like to get involved, please don’t hesitate to get a hold of me! We do post ‘teasers’ about upcoming events, but not their actual locations or times. The details are only administered via private messaging. Like us on Facebook to get posting updates, project previews and re-posts of event announcements around town!